The Hybrid Cards have more than two technologies embedded inside a single smart card. 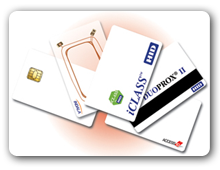 These cards use any two of the above mentioned types of the smart cards in a single chip. Some applications of smart card require more than two technologies like the proximity card and the contact card integrated in a single chip. Hybrid cards have multiple chips in the same card. These are typically attached to each interface separately, such as a MIFARE® Classic chip and antenna with a contact 7816 chip in the same card. Accommodates legacy system infrastructure while adding applications that require different e-card technologies.